Battling is as big to hip hop culture as graffiti and breakdancing. It’s how rappers settled who’s better, once and for all. For as long as battling has been around, it’s maintained an underground image. Undoubtedly, battle league giants such as Smack, Grind Time, URL, and KOTD have made significant gains in to launching battle rap into the pop culture realm, however it never really crossed that top tier market. With that being said, rap battling takes an unusual turn for the mainstream as none other than Eminem teams up with his label-mates, Slaughterhouse, to bring us a competition on a scale we haven’t quite seen before. Calling it the UFC of the rap world, watchLOUD and Shady Records will take over New York’s Hammerstein Ballroom on July 12th to put together a battle card that fans have been waiting to see for some time. The main event features mainstream hip hop veteran Joe Budden facing rap battle heavy weight Hollow Da Don with an undercard (more like a second main event) placing Murda Mook in a long sought rematch with Loaded Lux. 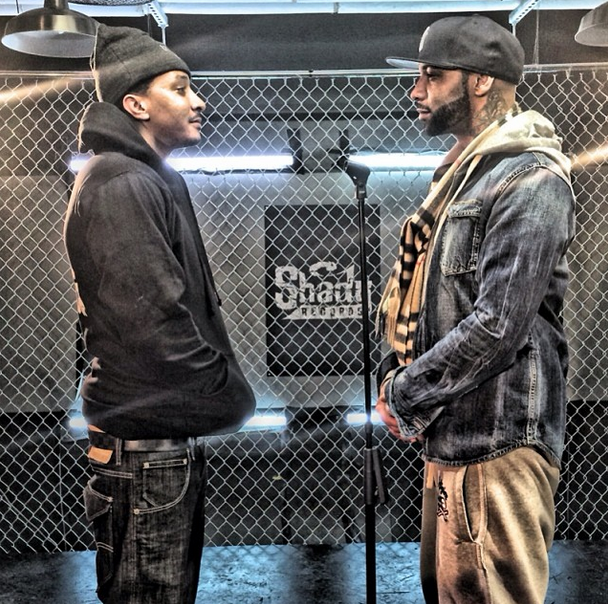 The latter of the two matchups is part of the reason battle rap is what it is today – Smack (one of the originals in modern battle rap leagues) pit these two dogs against one another in their early days and that battle remains one of the most highly viewed and controversial battles to this day. Watch it here if you haven’t yet. The entirety of the schedule for the July 12th event is yet to be determined. In a hype builder for the main event, Eminem will put on a four part series of battles featuring eight contestants trying to make it to the main event. Another UFC analogy – picture “The Fighter” but with battle rappers instead of Jiu Jitsu pros. The possibilities of having everything from a jaw dropping performance to an unfortunate occurrence of a cringe worthy choke appearance have left me eager with anticipation. Imagine Joe Budden dropping punchlines the caliber you haven’t heard from him in years, or on the contrary, he couldn’t even put together a 1-2 combo and goes home with this tail between his legs. Either way, you’re not going to want to be anywhere else when this goes down. You can see the entire Road to Total Slaughter on watchLOUD.com, and if you want to be in the building when it all goes down, tickets go on sale to the general public on May 16th. Check back on TheRapScene.com when it all goes down on July 12th and we’ll have a blow by blow breakdown of all the action.